(Rim-to-rim diameters 1 km or larger, based on Lunar Orbiter IV images. (Plato Rim diameter from point on the cusp of the inward bowing feature north) of faulted rock (West Rim Bow-in) to east rim edge = 62 miles (99.8 km). NOTE: Letters used below are *not* standard IAU secondary crater designators. NOTES: Although many amateurs rarely seem to see very much on the apparently smooth dark floor of Plato, the above craterlets are the ones most often reported by those lucky enough to get really good seeing. "A" is the easiest of this group due to its fairly prominent ramparts, and has been reported in a 4 to 5 inch aperture, although the unresolved "bump" of craterlet-A's ramparts is visible in only a 3.1 inch. 3 or 4 of these craterlets can sometimes be observed under low sun angle and in good to excellent seeing in apertures 6 inches and *larger*. These four can sometimes be "detected" as very tiny white spots in 3 to 5 inch scopes during the full moon, although to show them all as true pits often requires a 7 or 8 inch aperture. The "East Wall Pit" is a much larger irregular feature (4 miles across) which often hides in the shadow of the eastern wall during the lunar mornings. It may or may not be an impact crater. There is also a small nearly rimless craterlet "W" low on the west-northwest wall north of the west-rim bow-in which is about 2 miles across. It is considerably more difficult to observe than its size would indicate, as the sun has to be at just the right angle to allow any shadow to fill even part of it to make it visible. NOTES: Craterlet-e has been sighted in a good 8 inch, but craterlet-f may take a bit larger scope to see with any regularity. "e" tends to hide in the long early morning shadows, as "f" does also in the low lunar evening. The Lunar Orbiter shots of Plato show that "h" is a tiny double craterlet with 0.9 and 0.8 mile diameter components, forming an elongated 1.4 x 0.8 mile feature visible in larger apertures, but not fully resolved. Again, very high lunar sun may allow some of these cratelets to be "detected" as tiny white spots near full moon. 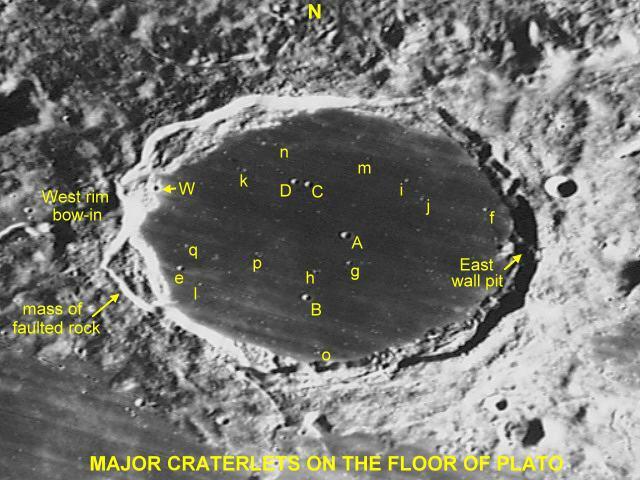 The "Big Four", and the "Little Four" probably represent most of the craterlets on the floor of Plato which might be visible to amateurs using moderate to large apertures under excellent seeing. NOTES: These are *extremely* difficult to observe even in large apertures as anything other than tiny white spots or rimless pits, although i, j, m, and o2 have been imaged by Maurizio Di Scuillo using a CCD camera on a ten inch Newtonian optimized for high resolution planetary work. Craterlet k has a very small pit to its west and will be tough to resolve easily. Craterlet m is a fairly shallow bowl with little in the way of a rim, so it is more difficult than its size would indicate. "n" is a very small rimless pit just to the east of a tiny white spot which is often mistaken for a crater (may be a small mound or ejecta blanket). Craterlet o is a double craterlet, which forms a 1.3 mile x 0.7 mile elongated feature. p is a triple, consisting of 0.7 mile, 0.6 mile, and 0.3 mile craterlets in close promimity, which might be detectable in very large apertures as a single almost rimless 1.5 mile x 0.7 mile feature (not resolved). Craterlet q is two very small overlapping craterlets which form a single 1.3 mile x 0.6 mile feature. Lunar Orbiter images show a large number of smaller pits down to 0.25 miles across on the floor of Plato, but the above three "families" are probably the only ones which have much of a chance of being seen visually from Earth. to spend their time searching these craterlets! Thank you so much, David! A real expert's post! Nice! I don't have the scope for anything past 'e', but based on the LO photos it's all a very sound selection-- until you get to the 'tiny nine' then there are some problems. There are at least half a dozen more craters 1km & larger than shown. 'h' is indicated plainly separated on the pre-LO LAC chart of Plato (made using photos from various large observatory telescopes and visually checked with the Lowell refractor) and Higgins' photos with his 18" also shows them plainly separated & resolved so they may not be all that difficult to resolve with a larger instrument. On the same note, the LAC also clearly indicates 'p' as two craters, one irregular and slightly larger on it's major axis; which is accurate as the LO photo shows the southern is indeed an irregular form with the third between them as an invisibly small crater of less than .5km--but there is no hope of seeing this crater with any telescope, even as an additive, unresolved feature. Photographicly it *might* be indicated as a tiny white spot on Higgins' best Plato pic, as enhanced by Woods--or maybe not hard to tell--but if that lonely little white spot is it, it is a clearly separated feature. Higgins' Plato photo link (in the unenhanced version) I feel gives a good idea of what craterlets might actually be glimpsible with a larger amateur instrument under the best conditions of illumination and seeing, based on what shows most plainly in that image. Notice all the craterlets you indicated are indeed among the ones most prominent! --but there are a couple more just as plain that you didn't indicate; one just nw of 'D' and one NE of 'i'--but maybe you can come up with a couple more letters to complete the picture? ; then there are several others of the same size/definition as 'm' as well...(perhaps a listing complete all the way down to 1km is a bit unwieldy?). At any rate, nice job! Very very very useful, David. Now I know what that "crater-like" feature is on the west rim: a faulted area. I've seen A and the East Wall Pit, and I have a lifetime to go to see if I can pull out any of the other features you have illustrated and described here. Seems like a funny thing to want to do (spot bits of damage inside a larger bit of damage), but that's what this activity is all about! I made it sticky so it won't sink down out of sight. The image *is* a Lunar Orbiter image (in fact, it is LO IV 127 hv) which has been processed and partially rectified to show a more terrestrial orientation. The craterlets identfied were those which Marizio and I could agree on from an image he took with one of those fantastic 10 inch scopes he produced at one time. Since then, several images with 16 inch and larger apertures have shown more, but again, most of these are unlikely to be seen visually in most amateur instruments (heck, most people seem to have trouble even getting the "Big Four (plus 1). Clear skies to you. Very good idea, ds. Thanks. Thanks David for this post and the timing was just right for me! I've been trying unsuccessfully for these craterlets for some time. But tonight - SUCCESS!! I guess it's all in the illumination and with the moon at 12 days, the brighter rim makes them stand out. I am using a WO 80mm Fluorite APO, so catching them is really at the outside limit here for this size scope (I've not heard yet of anyone having success in anything much smaller and the exquisite optics of this scope make a big difference). Craterlet A was actually an easy catch and spotted immediately at 144x with a Burgess binoviewer (12mm Burgess EP's with 1.8 OCA and 2x Televue Barlow). At that point I went to my 8mm Radians for 216x which, while it does not show much more detail, is still very usable and has the advantage of more eye relief (so I'm not bumping the scope). B, C and D were then observable most of the time and during a few clear moments, I was able to distinguish the CD pair from B, although this was definitely right at the limit and more like noticing a double is elongated even though it cannot be split. The moon was only around 28deg above the horizon so there was quite a bit of turbulence - I am looking forward to trying this when the moon is substantially higher up in the sky. I tried looking cyclops-mode with my 3-6m Radian zoom on the TV Barlow at 240x, but only A was visible - I never did catch the other three, although I was moving the scope every few minutes to dodge trees so I didn't give it a completely fair shake. I think the binoviewer is a huge help for me when observing at the limit because it averages out the floaters that are always plaguing my viewing (ahh the joys of aging ). But I'm now a happy camper - I was convinced I could catch a glimpse of the big four with my 80mm scope - but in the last few viewing sessions, the skies were only clear a couple of days earlier in the cycle - too early to have that bright rim stand out (which of course is what I was catching a view of here). There are at least half a dozen more craters 1km & larger than shown. Well, the orginal image is from Lunar Orbiter IV, and shows probably more than 50 craterlets. The exact scale is not certain (error in the listed crater diameters is probably on the order of +/- 0.3 km), but I did measurements from the original Lunar Orbiter image frame which had decent scale data available. There are very few craters of a size significantly larger than the ones labled in the image (i.e. those that probably exceed nearly a kilometer in width. The ones I labled are those which Maurizio Di Scuillo and I had extensive discussions on when reviewing his highest resolution image which showed significantly more than the usual 4 to 6 craterlets most often reported (taken with a 10 inch planetary Newtonian BTW). I wish I could pull up that old image, but it showed clear indications of around 20 possible craterlets. I should probably eliminate everything 1 km or below just to keep the diagram a little less cluttered. 'h' is indicated plainly separated on the pre-LO LAC chart of Plato (made using photos from various large observatory telescopes and visually checked with the Lowell refractor) and Higgins' photos with his 18" also shows them plainly separated & resolved so they may not be all that difficult to resolve with a larger instrument. I suppose it depends on how one defines a "large" instrument . I find h to be rather difficult in my 10 inch, and usually, I see only the "big-4 +1" e and f, and occasionally g and h under excellent conditions. Once, I did manage i and j, but they were marginal at best. If the sun is high at all, only the "Big Four" tend to be visible. Of course, there are many times when even in Hyde's C14, all we would see would be the "Big Four". On the same note, the LAC also clearly indicates 'p' as two craters, one irregular and slightly larger on it's major axis; which is accurate as the LO photo shows the southern is indeed an irregular form with the third between them as an invisibly small crater of less than .5km--but there is no hope of seeing this crater with any telescope, even as an additive, unresolved feature. The Lunar Orbiter image of Plato clearly shows that p is indeed a triple, but the third member is, as you indicated, probably not visible from ground-based telescopes. 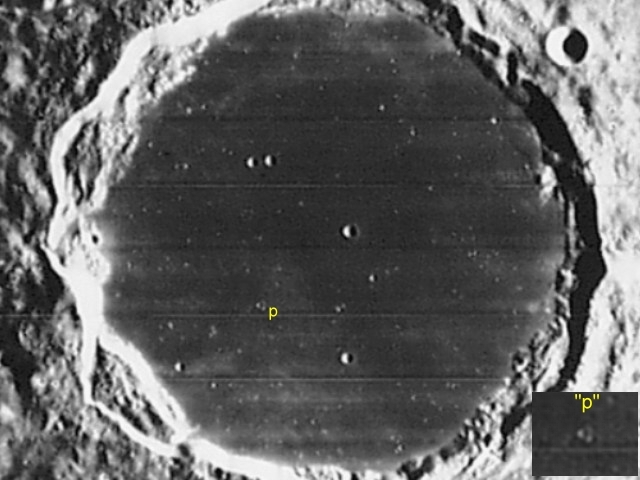 It is a much shallower pit sitting adjacent to the other two, and the mentioning that p is a triple was not to indicate that three craterlets are visible in the telescope. Below is a section of the original L.O. image enlarged and enhanced a bit (with "p" enlarged) to make the numerous crater pits more easily seen. Clear skies to you. I've heard observing Plato near full moon makes seeing the small craters inside easier? Is this true? I had my best go at the craterlets during a night of almost perfect seeing on April 4th, 2004 (full Moon). I used my 6" achro at 300x. In advance I knew only positions of the major craterlets A, B, C and D. These were easy as were craterlets e, f and g (that makes 7). I also detected craterlet p. The most difficult was craterlet g. That makes a total of 9. The smaller craterlets appeared as bright points on the crater floor. With the terminator close to Plato, I've never been able to see more that the big 4, but I've also never had really good seeing when looking for them. I might give it a go during the next Last Quarter. Well, you can "detect" at least some of the cratelets as tiny white dots when the sun angle is high, but this isn't really resolving them as the true pits they are. I have seen the central "A" craterlet's spot in my 80mm f/5 refractor on a night when the moon was nearly full, but again, the craterlet is not resolved as a true pit (that would take something in the 4 to 6 inch aperture range). However, some of the white spots on the floor of Plato do not correspond to actual physical pits, so you have to be a little careful here. Clear skies to you. I've unstuck this thread and added it to the "Best Of" listing.